It is so old style that it is antique, in a good, classy kind of way. Even more so when there will be a whole crew of them. I am really looking toward seeing them in paint. Cheers! Yeah, I'm currently a bit stuck on which weapons to give them. 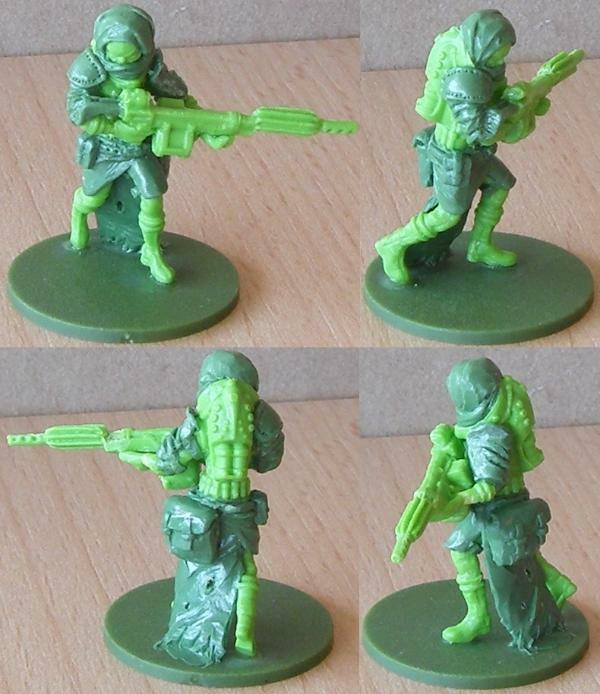 I want one with a rifle, and the simplest way of doing that is to give him a laser rifle as I'll have some spare after converting combat armored Minutemen. But I'm not sure if that not too high-tech for the idea of an alien stranded in a hostile environment who has to make do with what he can fight. Perhaps a projectile weapon would be better. Maybe a pipe rifle from a Super Mutant. Then there's the close combat one. I wouldn't mind a power fist, but there again there's something about the idea of a skinny alien beating people to death with a wrench or a baseball bat or something similarly low tech. 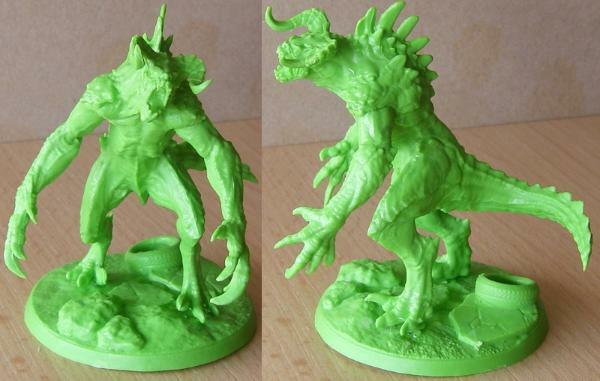 Plus, I'd like to start slow and bits swap to get a better feel for Modiphius's models before I go and do anything more than basic sculpting on them. Which currently limits my options somewhat. What time is it, you ask? Why, it's time for SCIENCE! After this short commercial break! Join the Minutemen! See the world! Get eaten by Deathclaws! So this is my first conversion work on Wasteland Warfare models. Simple stuff to get a feel for the models as they are very fine, pretty realistically sculpted models and different from what I usually work with. 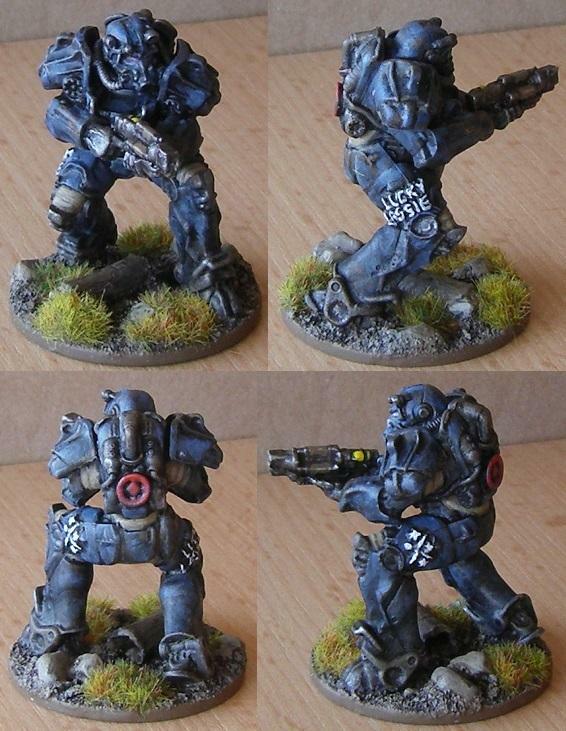 Not very spectacular, but I was especially keen on seeing how small I could sculpt symbols so that I don't have to sit there and paint freehand faction symbols on power armor. Might just look the part when it's all painted, which will be a while still. 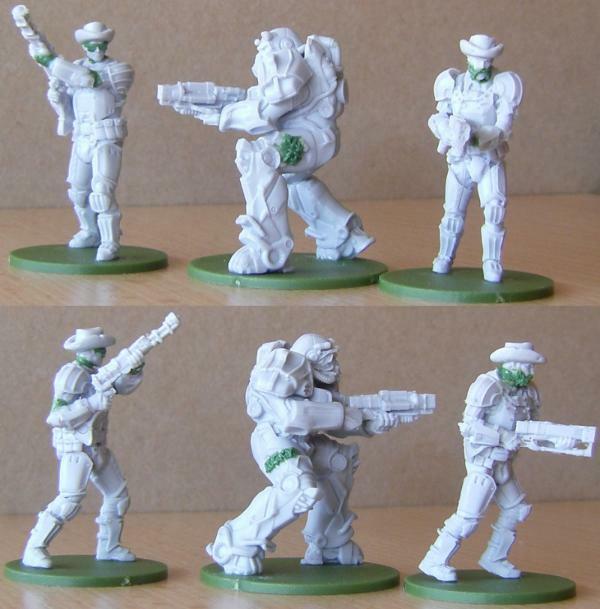 I also had some fun with rednecks in combat armor to get a bit of variation into my Minutemen band. I imagine those two as a sniper team. One has a laser musket ( ) and does the sniping, the other guy has a real weapon and watches his back. I said it before, not sure if in this thread, but I'm not a fan of PVC. I will say though that if there is a redeeming quality,, I will go and make the most of it. In the case of PVC, it's that hot temperature can deform the model quite easily but it only retains its new shape if it's shock cooled. For instance, one of my Zetans was limboing on his base when I got the starter set but when I got him out two weeks later, he was standing upright as intended with no help from me whatsoever. Whereas I fixed Glowy with boiling water and rapidly cooled it down in cold water. So technically the foundation for greatness is laid. Now, I'm not hurting for Deathclaws. I've got two resin ones that will get different paint jobs so I'm ok with them mimicking Glowy's pose, but since I have a couple more in PVC and PVC behaves as described above, I figured I don't need to convert the additional models tediously if I can just reposition them with hot water for five or ten minutes. If, and this is the part that's going to take a little time, the model does in fact retain the new pose. Enter Snuggles. I just so happened to have boiling water and a spare ten minutes to hand and I think you can do a couple of neat things without ever putting a knife to the model. Nice. I found that the thighs were a bit thick and attached to the body too rigidly to alter the pose of the left leg much, but the torso and arms bent admirably and I'm happy with how the new pose has turned out. I'll eventually take the model off its base and put it on a flat one, and will probably have to resort to shaping the base to fit the legs instead of the other way around because of the aforementioned trouble with the thighs. I might have to do some more bending instead, but we're going to have to wait and see. For now the interesting part will be to see if the model retains its new pose. I'll probably leave it alone for a couple of weeks to see if anything happens. Would have been better to try this in summer when it's hot and the PVC is more likely deform (if it does in fact deform, that is), but what can you do? I threw the model in hot water again after it bent back a good bit to see if it was anything I did (and I think I like the tail better if it's somewhat straight) and this time tried to overbend it a bit. the idea being that if it's bent more extremely it won't bend back quite as far as if you go about it too gently. I'm still going to give this some time, but after eleven days it seems to have settled from the pose shown in the previous picture to what you can see in this one. I'm guessing I can expect it to hold this one, though as I said I'll watch it some more time since other projects keep me busy at the moment. I love your terrain, it's really quite fantastic. 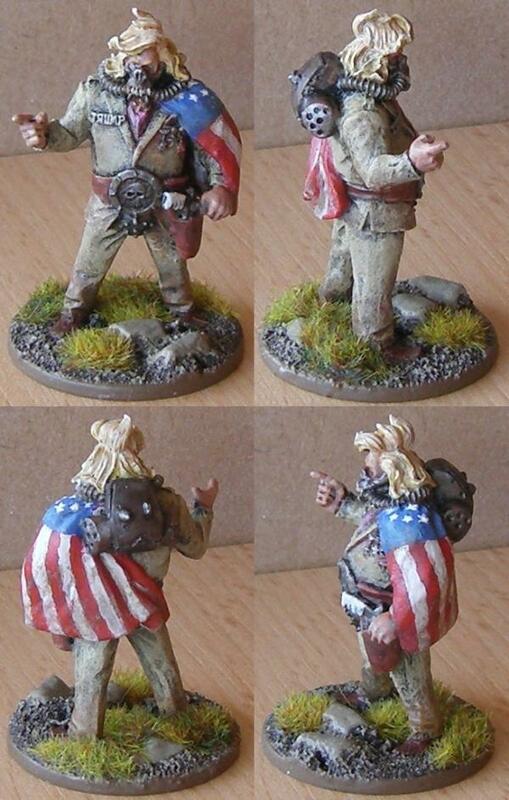 The first painted Minuteman is a tin can. That means unlike every other Minuteman she has a good chance of survival. Hurray! Hopefully this should mark a return to slightly quicker updates again. I got the tedium of painting my Star Wars Legion core troops over with, which frees up time to paint Fallout models again. Which I'm very happy with as I hate batch painting and very much prefer to work on individuals. Looks very neat in a proper kind of way. An industrial sort of blue and a very fitting freehand. Thank you. The "freehand" is sculpted, as can be seen a couple of posts up. I hate painting stars, especially small ones. So with this model I tried to sculpt them and see how that works for me. Turns out I hate sculpting stars as well. Let's make the Wasteland great again, shiny and chrome! Tobias Trump, Mayor of Libertytown. So yeah, who needs plans anyway? Lassie and Tobias both looking good there. Hm... I've missed that on Your earlier photos. But stars trump everything, right? Looking very good, even better for the Wasteland! Overall I'm happy with how it turned out. When I paint the next one I'll probably try it without the silver layer on the windows and trust on the varnish to make them look shiny and reflective. Rust looks good, nice job! I mentioned earlier that I had another billboard that I put the sketch for the freehand on (the tough part anyway - the Nuka-Cola logo and font in big, friendly letters shouldn't be too terrible). It seemed like a good idea at the time, until I noticed that I hadn't even finished painting the billboard yet. Considering I'm somewhat hesitant to put lots of work into a freehand only to mess it up when I paint anything around it, I went and rectified that. 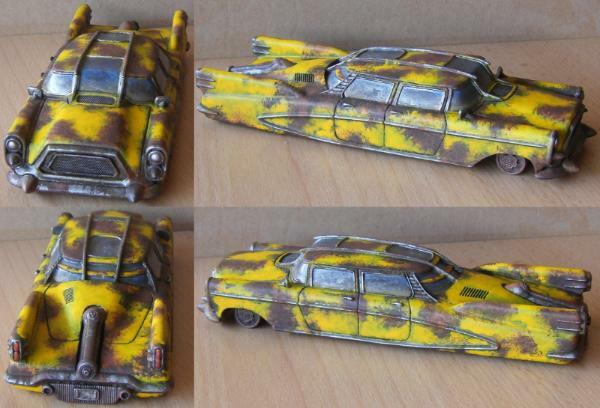 Which benefitted from the work I had done on the rusted car. It's a bit of an experiment. I painted the previous billboard a lot more silvery and less worn. It will be good to eventually see these next to each other and see which one I like better. I'm cool with having scenery pieces with various levels of wear (they are still styled similarly, so they won't look off next to each other), but I will now doubt trend towards the look I like better on future pieces. The billboard is an on and off project so I don't know when I'll put more work in it. My focus is still on the Minutemen. I made some good progress on Nora and Dolph the Potentially Enslaved Tech today and should be able to finish them in a matter of days. After that I already have the combat armored Minutemen and a normal one queued, but I'm doing a bit of work on a variety of different things, so I can't say yet will get done next. I like this one, but - just a thought from a passer-by. I'll start on these windows. Before trying to make them shiny and reflective You can try to make them dull. Pick a base color that can be a mix of interior and exterior, so anything like a yellow, dark brown, even green. Give it a gradient from the top down to the darker shade and then dust it a LOT. Windows tend to accumulate small particles over the years, like rust and sand, so anything left by the road long enough will lose all shine but acquire a lot of "added taste". And the WIP is very promising! I don't have much experience with reflective and translucent items yet, nor much of an opinion what I like best or how to go about it. That sounds like something I'm going to give a try. While I'm at it I'll make a red car with the existing approach minus the the silver layer. That'll give me a couple of approaches to pick from and see what works best for me. I might need that for other glassy surfaces eventually as well. *When I get around to it, of course. No shortage of projects these days. Just a quick project in between other stuff. 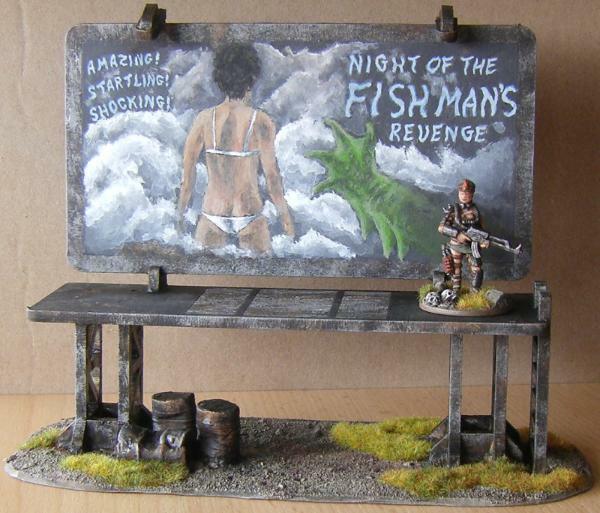 I had it lying around since September and really felt like doing it last week, so a short assembly and a bit of painting later I have a small, new scenery piece in my collection. 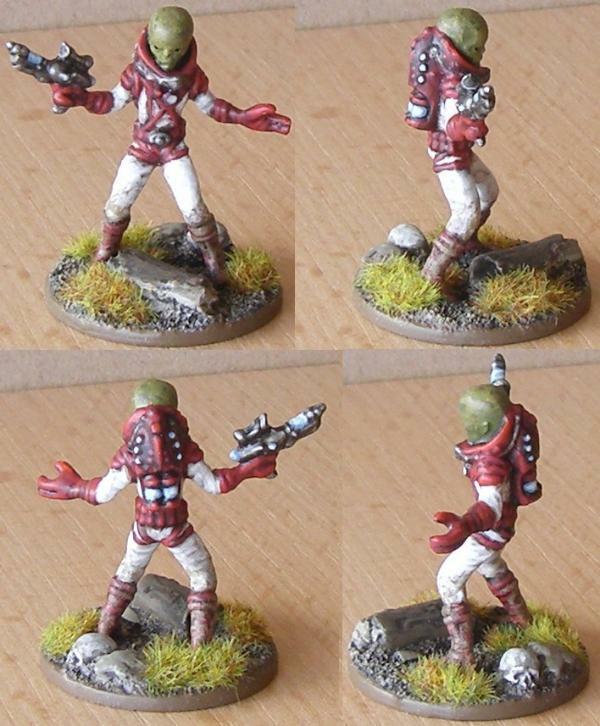 I intend to keep painting the Minutemen, but I also just had an idea what to do with my Zetans, specifically the melee one. I already started cutting him up and if all goes well he'll get a ripper on a stick along with a pose to match. I might have to try experimenting some more down the line. Probably on a different creature than a Deathclaw. 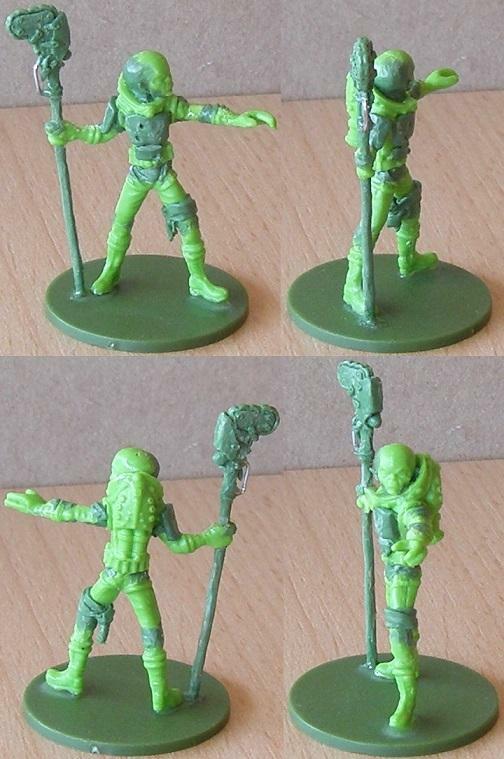 Maybe Modiphius releases some Mirelurks until then. The shells should make for a much greater contrast than anything a Deathclaw or a Glowing One has to offer. 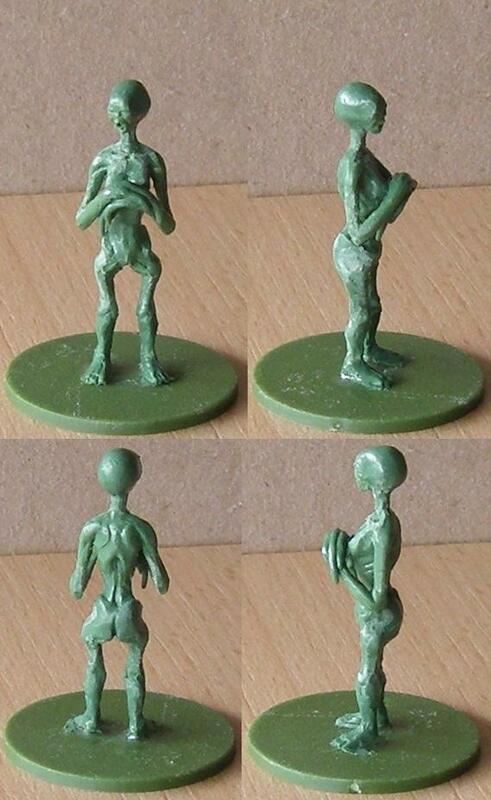 It's time for the little green men. Spoilered because there are no pants on Mars. 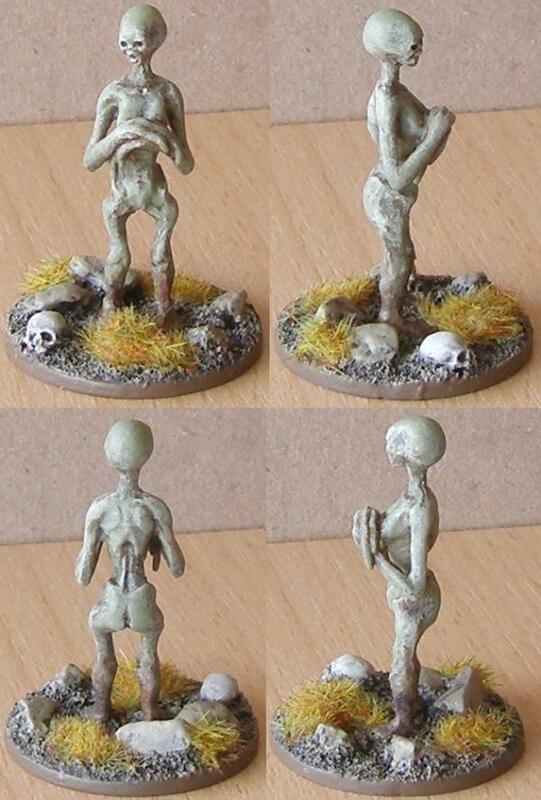 As part of my band of stranded Zetans I sculpted a human-alien hybrid. Loosely inspired by Fallout 3 concept art with a good helping of happy-go-lucky sculpting, I finally have a model I wanted for a while now. 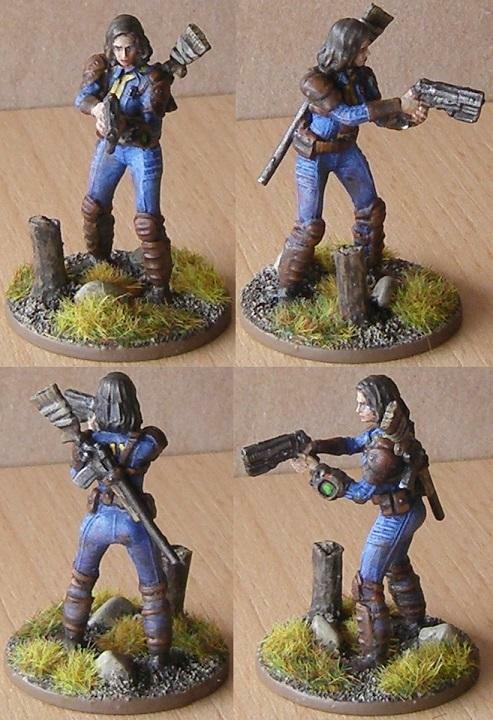 I used to have this same warband, minus the already painted one, using stand-ins from Mars Attacks and, for the hybrid, a slightly converted female Wargames Factory zombie as a quick way to get models on the table. 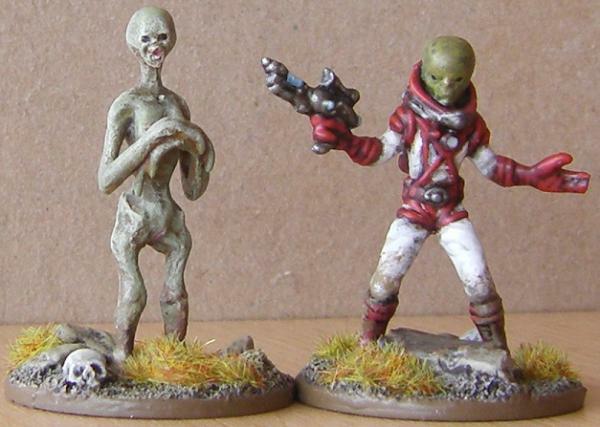 The intent had always been to upgrade them at some point to properly represent Fallout aliens. 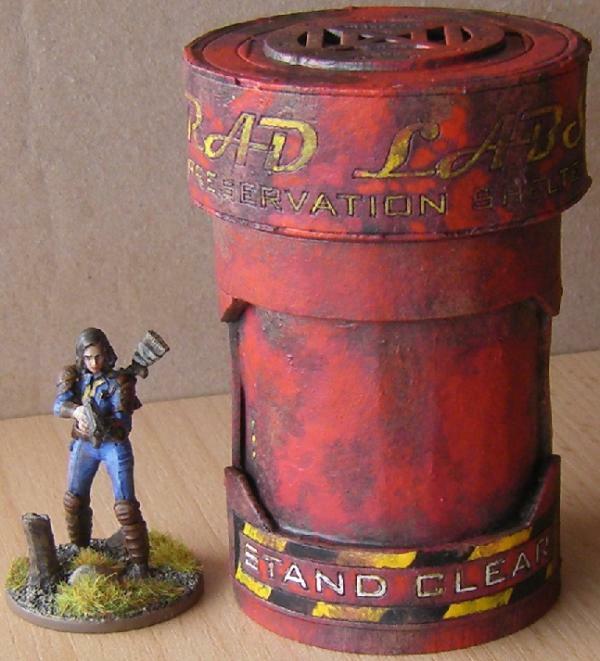 That was prior to the announcement of Wasteland Warfare, which sorted out the Zetans nicely with the promotional model. Since Abominations from Mothership Zeta are bound to be a good while off, I just made my own since the band only needs one. The other two Zetans are well on their way and while they are not the focus of my sculpting, they get frequent additions and shouldn't take too much longer than if I put as much time into them as possible. The reason for this is, obviously, that a full sculpt demands some attention and takes a good while to do, leaving less time for the mere conversions. 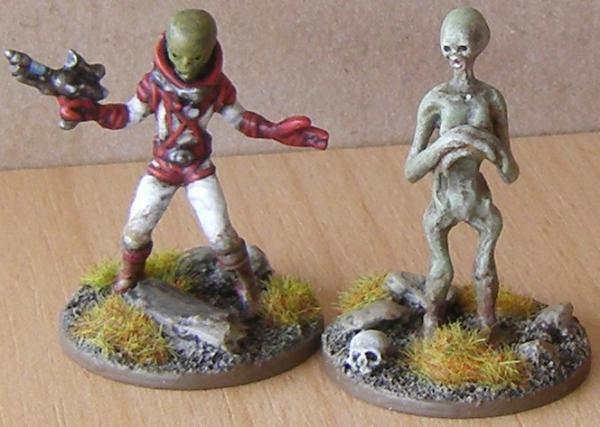 And because sculpting one model isn't enough, the hybrid is closely followed by a human model for the alien band. Billy Joe, by merit of being a hillbilly and a bit dim, was able to take the role of Igor for the stranded Zetans. If they want to experiment on humans, he's the one who hits unsuspecting wastelanders over the head with a shovel and drags them to their hideout*. And since I have a pretty clear vision of how he is supposed to look he's going to get a sculpt of his own. I think it might be fun to bolster the ranks of the band with a reprogrammed Protectron or two. 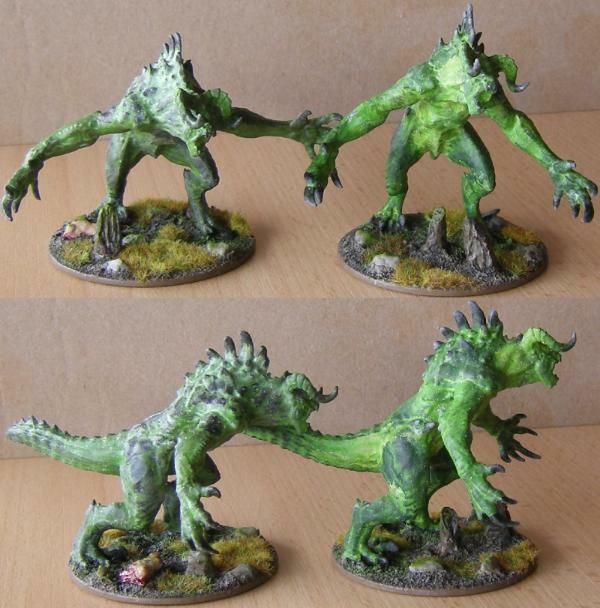 Maybe convert them similar to what you see with Rust Devils to make them specifically attached to the Zetans in look. 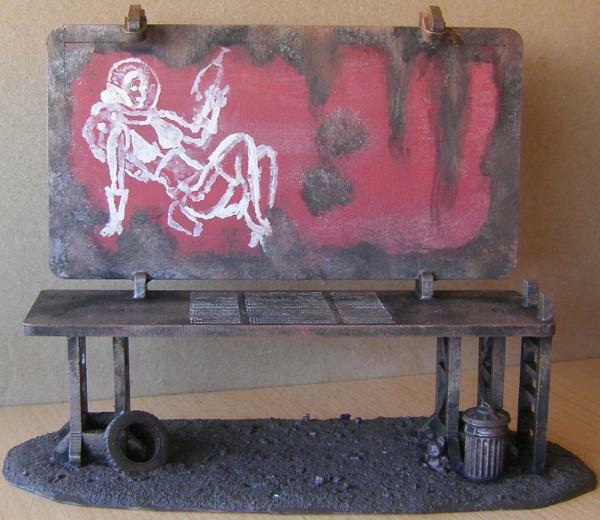 *While I don't have any real plan for an alien hideout at the moment, it did occur to me that adding an alien biolab in a ruined building or some such to my scenery collection might be a cool idea worth thinking about. Yep. 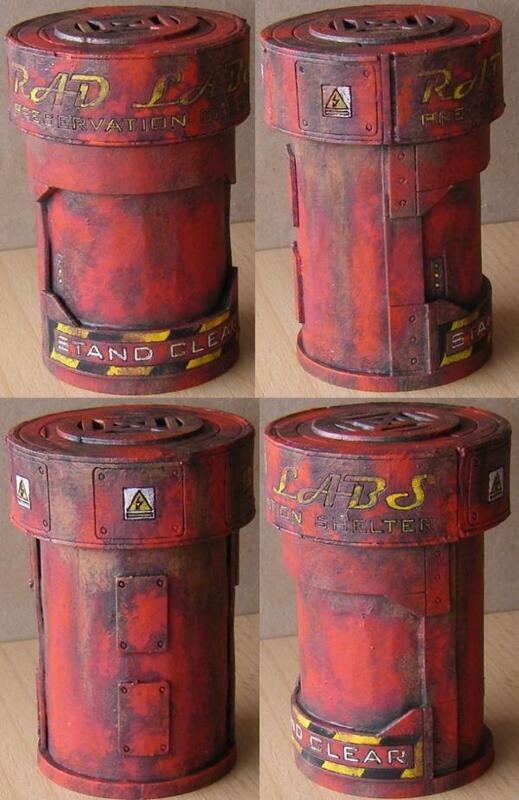 An alien lab in abandoned barn or broken building would be very cool! Sculpting is cool. 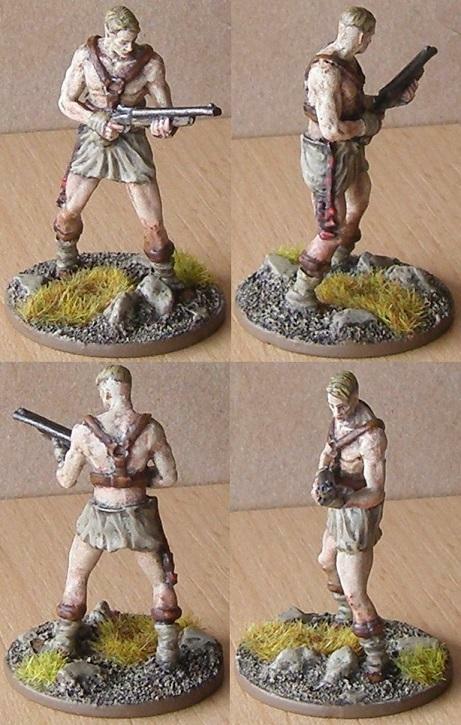 He is standing on Renedra 25mm base, isn't he? Nice texture for such small figure! 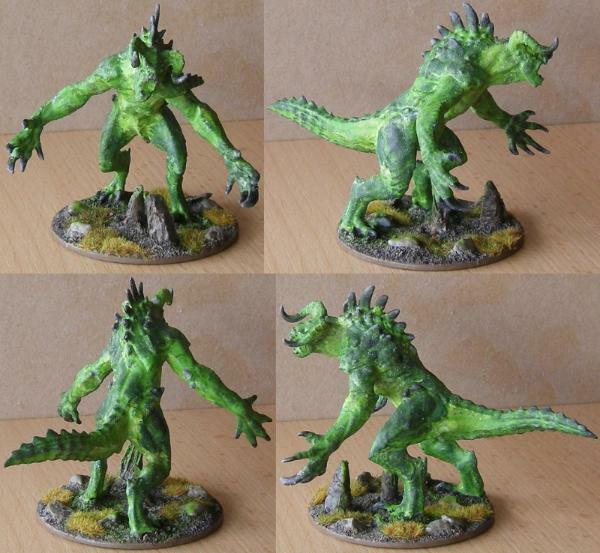 Yes, the hybrid is on a 25mm base by Renedra. I put all my human sized models on that (and smaller, like dogs). The lab will probably not be in a barn as I have one already. Maybe something more urban or industrial. I have a fair few untouched Mantic plastic tiles for brick houses and factories that I've been wanting to use for years now. But we'll see. What I do know is the building needs to have a crudely thrown together satellite dish on the roof. You know, to phone home and all that. I didn't really have much of a direction when I started, other than crashed alien going native, but after repositioning and adding a few armor plates I figured less may be more and left it at that. The other Zetan I'm working on will be covered up a good bit more, and I'd hate to cover up too many identifying marks and lose faction coherency across these guys. Painting the hybrid got delayed because I found the remains of my green paint dried up in the pot. I got a replacement and will finish the model when I have a little more time. Shouldn't be too long, though. As with the other one, I'm trying not to cover him up completely so as not to hide the spacesuit too much. I did opt for a covered head though since that's the third time I use the same one with the same expression and a hood is a good fix for that. Next to the nice and sharp greenstuff the plastic looks almost melted and soft on all details. :( Other than that - superb work!